Kismit is a cosmic hero in the Marvel universe. She is a female version of the male hero Adam Warlock. It is possible she could appear in Guardians of the Galaxy Volume 2 see Rumors (Spoiler Warning) at the bottom of the page. Names: Kismit has had various names over her comic career including Paragon, Kismit, Her (Like Warlock's "Him", and Ayesha. The best scientists in the world create a group called the Enclave. By having the most bleeding edge technology in the world the Enclave create a massive and highly advanced laboratory fortress called the Beehive. The Enclave manages to create a perfect life form whom they hope to control however this lifeform breaks from the cocoon that is housing him and defeats the Enclave. This lifeform is first called Him and later calls himself Adam Warlock. The Enclave are not finished yet and create another life form. This time they manipulate Doctor Strange and the Hulk into helping contain the advanced lifeform. Once again the Lifeform catches wind of the scientists evil plans and escapes. This new lifeform goes on to destroy the Beehive then goes back into her cocoon to rest and meditate. While meditating the lifeform learns of the previous creation of Him and Adam Warlock. The lifeform then decides to make itself into a female so the two can mate. The lifeform calls it self Her. Her sets out to find Adam Warlock. She goes on an adventure with Moon Dragon, The Thing, and Alicia Master where she learns that Warlock had been killed. She attempts to resurrect the hero but as his soul is stuck in the soul gem the Warlock she creates is soulless. Confounded by this problem she is flooded with depressive emotions that she does not know how to deal with, and she flees from the other heroes. She has an adventure on a another world with the Avengers and Alpha Flight. She then does manage to fully resurrect Adam Warlock. She begins to realize that possessing the same genetic material as Adam actually makes him a poor mate. She then selects a group of other heroes who she hopes to mate with that includes Quasar, Wonderman, Hyperion, Hercules, Doc Sampson and Ikaris. She is attacked for being too forceful in these attempts. She goes onto aid Quasar in operation Galactic Storm where she helps fight the Kree and the Black Fleet. Later the Enclave returns and manages to gain her powers for themselves. However, they lack control of the powers and are forced to flee Earth. They later return and enslave Kismit and she takes on a new name Ayesha. As Ayesha she uses telepathic powers to battle heroes but is ultimately defeated along with Enclave. Elizabeth Debicki has been hired to play a character called Ayesha. Ayesha is of course one of the names used by the character Kismit. This is actually the name she uses when being mind controlled by the Enclave. It is thought she may be the primary villain in Guardians of the Galaxy volume 2. Debicki has appeared notably in the films the Great Gatsby and the Man from U.N.C.L.E. She also stars in the show The Night Manager that also includes Marvel Alum Tom Hiddleston (Aka Loki from the Thor and Avenger films). Tom was apparently one of the first people that Elizabeth told about her being cast and he was extremely excited for her. Given her profile as an up and coming actress I expect this part to be a fairly large or at least important one. The first picture of Ayesha is really cool. It really pops and stands out against everything else. Ayesha has bright gold skin, hair and clothes. She sits on the thrown with guards who are also all gold. The throne is very vibrantly beautiful. The throne is alike a star burst set against a cosmic/space sky. Is she from the Cocoon? 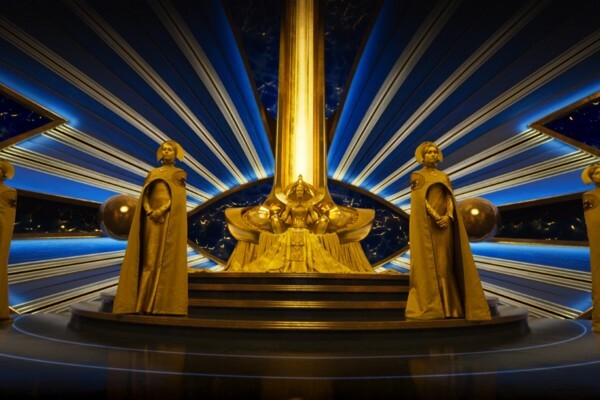 One interesting thing is that a cocoon appears in the Collector's museum in the after credit scene of Thor 2 and later in the film Guardians of the Galaxy. Everyone assumed that the cocoon belonged to Adam Warlock. However, with this casting it seems entirely possible that the character in the cocoon was Kismit/Ayesha and not Adam. It is also possible that Ayesha could searching down Adam Warlock. One long running vien of speculation is that Starlord could be the offspring of Adam Warlock which would unite both characters in search for Adam though for very different reasons. One other side bar thought- Her origin does involve Doctor Strange. The circumstances of him helping the Enclave are certainly bizarre so I don't think that will be replicated in the cinematic version of the character but it is possible...especially considering that Doctor Strange is also set to appear in his own film around the same time. More Guardians of the Galaxy!